A new 3K Higher Resolution 2960 x 1440 display that fills almost the entire front face of the phone from edge-to-edge, resulting in a larger 5.8 inch display with a taller height to width Aspect Ratio of 18.5: 9 = 2.05. A new and accurate full 100% DCI-P3 Color Gamut that is also used for 4K TVs. (Note: this performance is antithetical to Samsung’s TV strategy when they claim that QD enhance LED LCDS have a WCG than OLEDs). It is the first Smartphone to be certified by the UHD Alliance for Mobile HDR Premium, which allows it to play all of the latest content produced for 4K UHD Premium TVs. The Native Color Gamut of the Galaxy S8 is even larger, the result of its new high saturation “Deep Red” OLED, resulting in a very impressive 113% of DCI-P3 and 142% of sRGB / Rec.709 Gamuts that also produces better on-screen Colors in High Ambient Light. The Galaxy S8 has 5% to 19% Higher Screen Brightness, plus a record Peak Brightness of over 1,000 nits. The Galaxy S8 has a 5.8 inch (5.2” x 2.5”) curved screen OLED display. The larger Galaxy S8+ has a 6.2 inch (5.6” x 2.7”) curved screen OLED display with the same display performance specs and the same 3K-2960x1440 resolution as the smaller Galaxy S8. For comparison, the 2016 Galaxy S7 has a 5.1-inch (4.4” x 2.5”) flat screen OLED display, and the Galaxy S7 Edge has a 5.5 inch (4.8” x 2.7”) curved screen display. The entire Galaxy S8 phone is 0.25 inches taller than the entire Galaxy S7 phone, and 0.1 inches shorter than the entire Galaxy S7 Edge phone. In 2016 we lab tested both Galaxy S7 models, which have the same display performance and the same 2.5K 2560x1440 resolution. Samsung has continued to enhance the stack architecture to utilize new materials from UDC and the adoption of the R’, B’ and B’ are used to increase the EQE. Common layers such as EIL, ETL, and HTL are continuously enhanced to improve performance. The next figure shows the evolution of the stack design. DisplayMate claims that more than two dozen manufacturers already make OLED Smartphones, and the new Full Screen Display design using a flexible OLED will be the new Flagship for all the upcoming future Top Tier Smartphones. LCDs are a great cutting edge high performance display technology for Tablets to TVs, but for small handheld Smartphones, OLED displays provide a number of significant advantages over LCDs including: being much thinner, much lighter, without needing a bezel providing a rimless edge-to-edge design. They can be made flexible and into curved screens, plus they have a very fast response time, better viewing angles, and an always-on display mode. OLEDs also provide better color accuracy, image contrast accuracy, and screen uniformity because of variations in the Backlights of LCDs. As a result of their very versatile power management capabilities, OLEDs are not only more power efficient than LCDs for most image content, but they now deliver much higher peak Brightness than LCDs because the maximum power can delivered to just the sub-pixels that are needed for producing the current image. However, for mostly all white screen content LCDs are likely to remain brighter and more power efficient for a while. 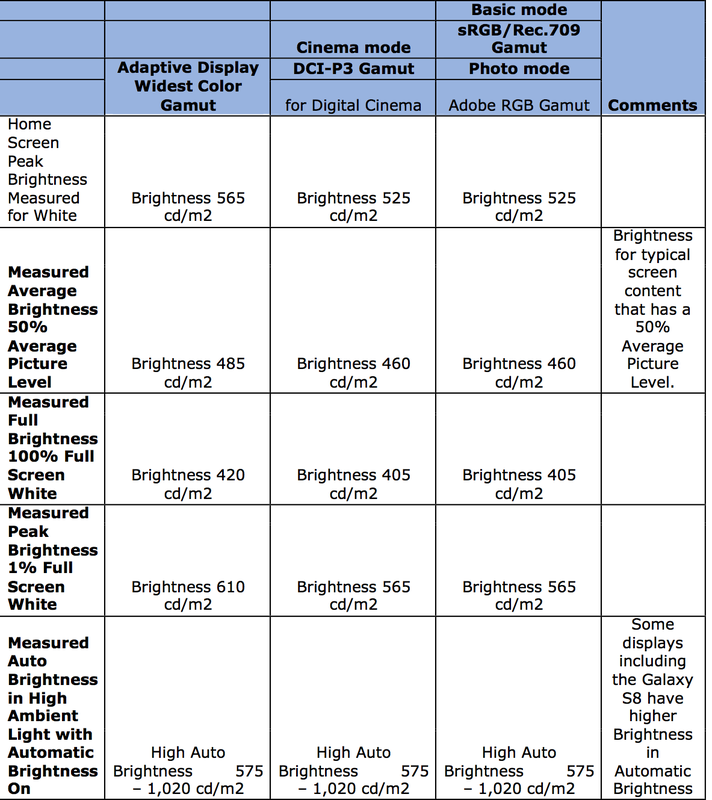 One of the inferior performance specs of OLEDs vs. LCDs has been its lower luminance. But the Galaxy S8, with is new material has reached peak brightness levels of over 1,000 cd/m2, when used in high ambient conditions. The measurements are the highest ever made for any display used for smartphones. The next table shows the luminance measures under various conditions and display modes. After a number of reports indicating that Samsung had 2 orders for OLED displays form Apple, for 100m and then 60m flexible panels, Korea-based ET News, Chosun Biz says that Apple has signed a two-year contract with Samsung Display for KRW10 trillion (US$9 billion) worth of flexible OLED panels. Based on the contract, Samsung Display will ship 70-92 million flexible OLED panels to Apple in 2017, which means that about 30% of iPhone devices shipped in 2017 will come with curved OLED panels, given that Apple currently ships about 200 million iPhone devices a year. Japan-based Nikkei also reported that Apple has ordered 70 million OLED panels from Samsung Display. But to meet increasing demand from Apple, Samsung Display has been exerting efforts to ramp up its capacity to 95 million units. Taiwan-based Yuanta Securities Investment Consulting has estimated that shipments of new iPhone devices are likely to reach 100 million units in 2017, of which at least 55 million will feature OLED panels. The shipment of 55m iPhone 8 smartphones in 2017, runs counter to reports by Chinese-language Economic Daily News (EDN) that Apple may delay the launch of its next-generation iPhone to October or even November, instead of September. Technical issues related to the lamination process of curved OLED panels, and the adoption of a 3D sensing system may cause the delay of the new iPhone devices, said the paper. Other sources said that they are watching the pull-in of orders for passive components from the iPhone's supply chain to see whether production of the new iPhone devices is on track, said the paper, adding that the supply chain should begin to pull in orders for passive components such as MLCCs in June. Major suppliers included in the iPhone supply chain include TSMC, Foxconn Electronics, Pegatron Technology, Wistron, Advanced Semiconductor Engineering (ASE), Largan Precision, Cyntec, Yageo and of course Samsung.